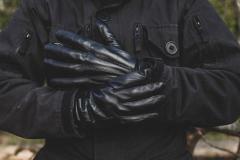 Classic strangler's leather gloves, lined with wool. A slightly shiny surface doesn't creak when you make a fist, but it looks darn cruel. The backhand has three zigzag-stitchings and the inner wrist has a short elastic section for an easy fit. The shell is flexible sheepskin with a dense surface texture. It's comfortable to wear and resists moisture and dirt. The lining is 85 % wool and 15 % Cashmere blend knit to provide comfort and insulation. 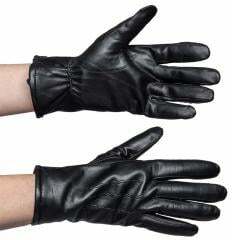 Sizes are in normal glove sizes, circumference of the palm in inches. 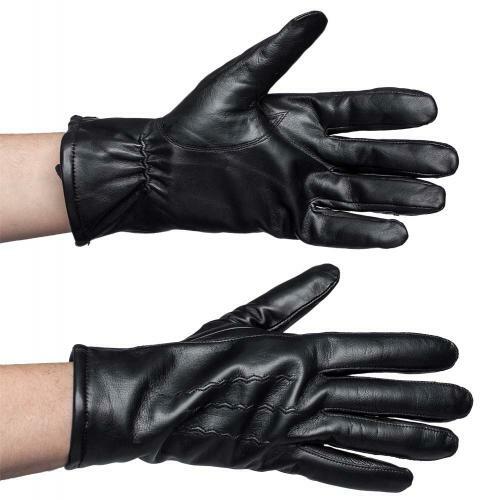 If you are like us and love skin-tight leather gloves, take one size smaller, and stretch them by wearing them in, making the gloves fit just right & tight. These are supplied to us by a Finnish family business founded in 1953, Mutka Ltd. Their contacts and experience in this field ensure quality for you. Laadukkaat nahkahanskat, ollut mulla käytössä kaksi vuotta jahyvät on. Nahka on pehmeää muotoutuu käteen niinkuin nahkahanskojen kuuluukin. Villavuori hyvin pehmeätä ja mukavaa, lämmittää hyvin. Villavuori kuluu puhki paikoista missä on kovin kulutus ei etu- ja keskisormien kämmenpuolen päät.